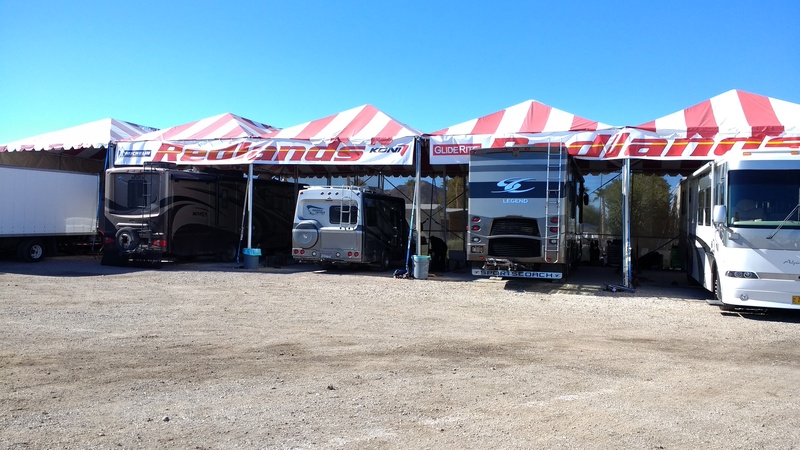 We had our Koni shocks installed earlier this week by Redlands at The Big Tent in Quartzsite. It was quite an organized operation. 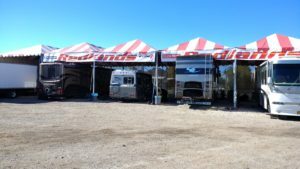 They had 4 big bays for motorhomes with a staging area for moving rigs around and a space for owners to go to write up the service ticket and pay the bill. 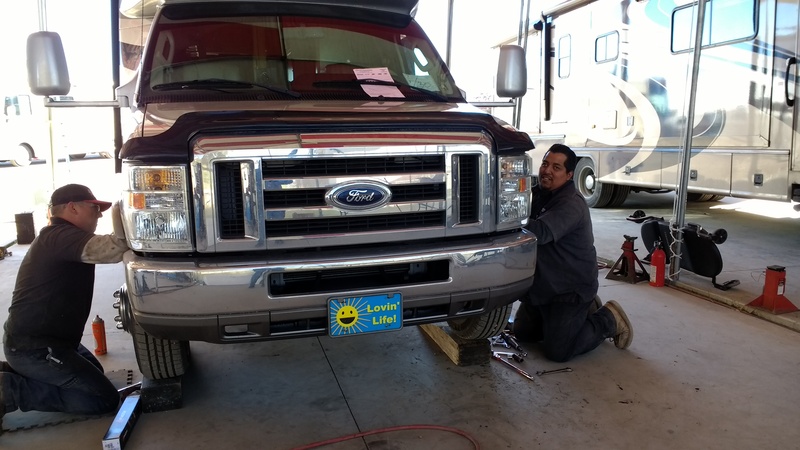 We also had our generator exhaust bracket fixed. The whole operation took about 3.5 hours. 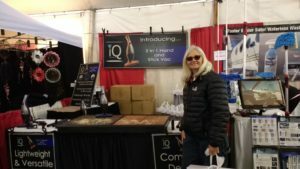 While they were working on our unit, we walked around the show. Later on we checked on the progress and were able to get some pictures of the guys working on it – there were three guys – one on each front wheel, and one underneath. While walking around the “The Big Tent” we made a few purchases. 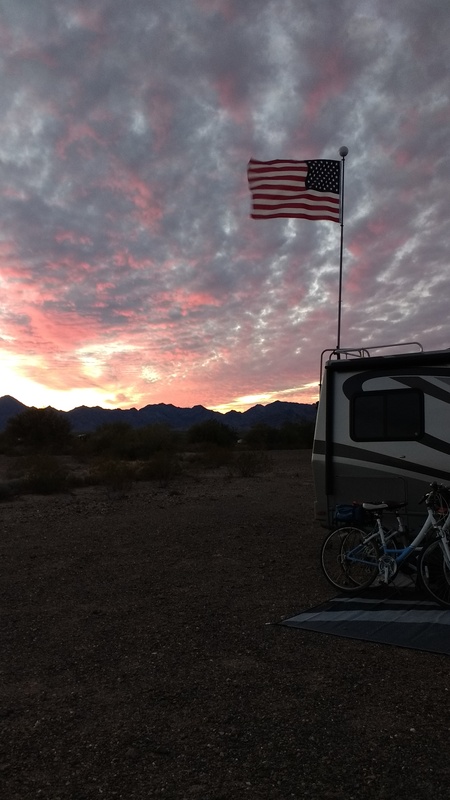 One of the things we bought was a flagpole designed to mount on a RV ladder. It is manufactured by a company called Flagpole Buddy. We had been looking into it for a while now and are very happy with it. We installed it and the wind is sure blowing! We also got a solar globe to go on top that lights our way home after dark when we walk back to the rig after visiting at a campfire. The desert sure is dark at night! Another item we purchased is a vacuum cleaner! We had left our old one at home because it wasn’t holding its charge anymore. We saw a demo of this vacuum and were impressed. This is actually a corded bag less vacuum that is small in size but is strong. It is the iQ 2 in 1 Handheld Stick Vac. We tested it out in the motor home which was in dire need of a deep cleaning. Sweeping with a broom was not cutting it! It has good pickup and did a pretty good job. 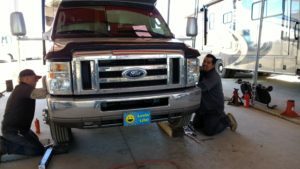 We took a test drive the day after we got our shocks installed and drove about 25 miles one way into the town of Blythe CA. We rode down I-10 – it turned out it was one of the worst stretches of interstates we have driven on the entire trip! It was a great test for the new shocks. There was a noticeable improvement and we didn’t feel like we were bottoming out. When semi’s passed us we didn’t feel like we were getting pulled or pushed into their wake. We are very happy with the performance of the new shocks. 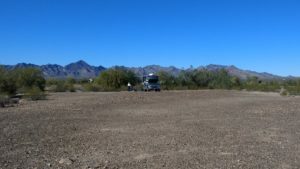 We bought a few groceries and then stopped to dump and get water at a small mini mart in Ehrenberg, AZ. It was $10.00 to dump and fill with water. 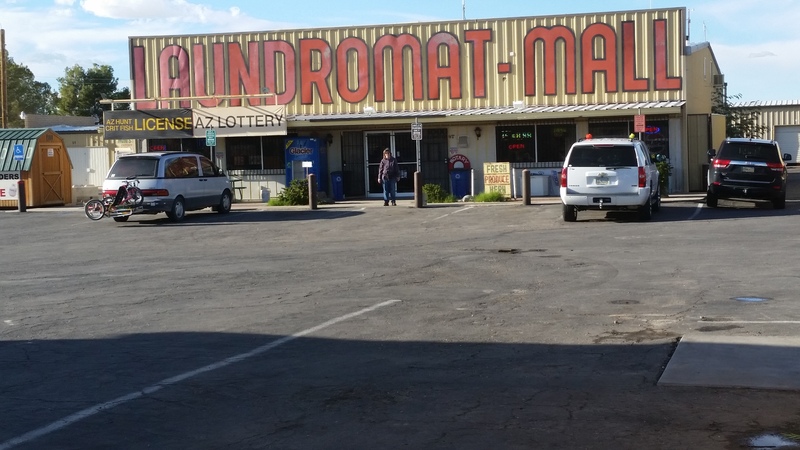 It was much cheaper here than in Quartzsite. 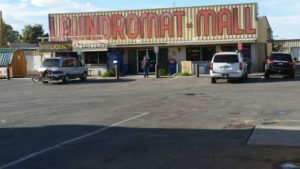 The Mini-Mart had a laundromat, showers, gas, campground, food items, fishing and hunting items and a little bit of everything else. 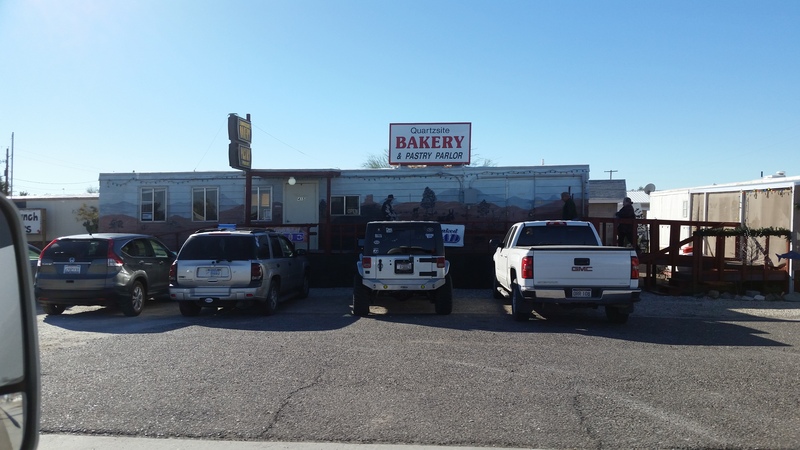 We have been hearing a lot of good reviews about this wonderful bakery in Quartzsite from our new friends. One morning we planned a trip into town to sample the goods for ourselves. We had been warned that they typically sell out by 9. We drove to the dog park and made some coffee. We indulged in our chocolate iced, cream-filled doughnuts which were among some of the best we have ever had. 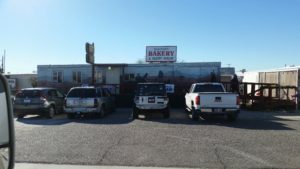 This is an old fashioned bakery and well worth the stop. 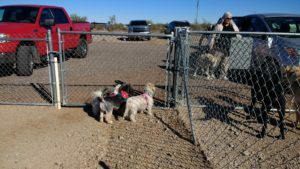 After breakfast, Heidi got to play in the dog park with some friends. 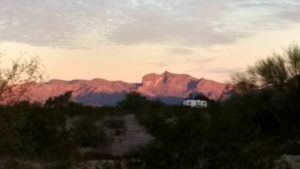 Eleven days of boondocking in the desert and loving it. We’ve been camping in the desert for several days now. The RVW rally is over but 10 rigs have remained camping at the BLM lands. 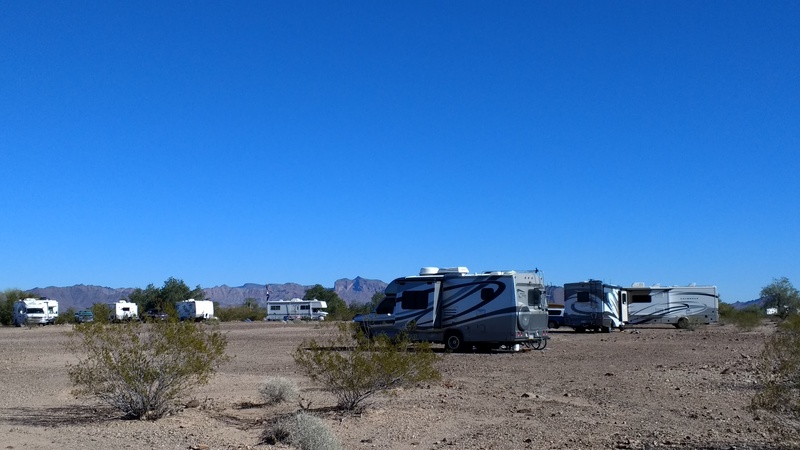 Most of the rigs that are left are from Colorado and are all camped in one area. 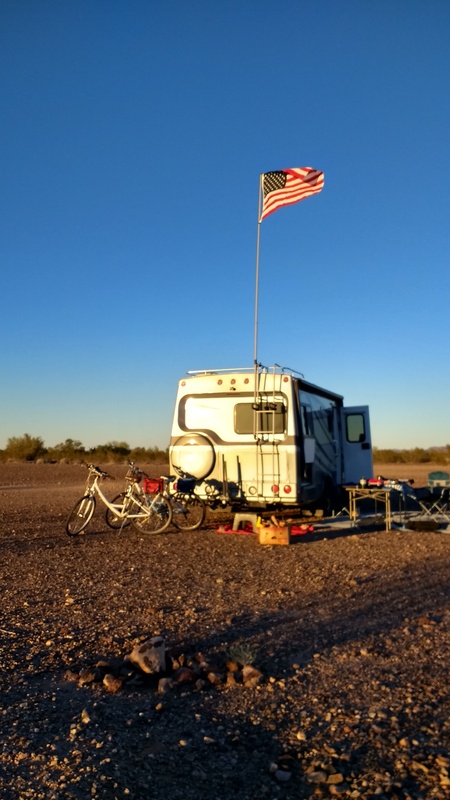 Our lonesome rig beckoned for some neighbors after everybody left. So we moved our rig a bit closer to our new RVW friends. This was actually a better spot as it was perfectly level and the gravel was much more fine and easier to walk on. We saw our first wildlife sightings of the trip today – twice in one day! We saw a coyote crossing the road on our doughnut run this morning. 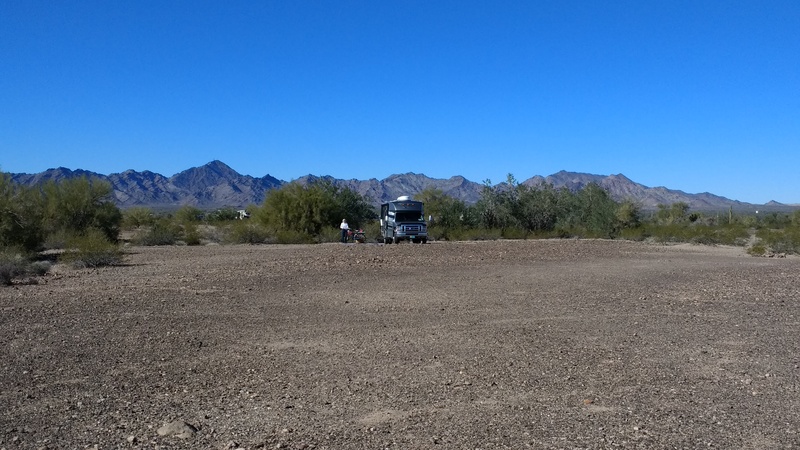 When we got back to camp and were outside, we were walking around the camper and happened to see a coyote at the edge of the brush across the gravel. He walked along the edge and then crossed over the gravel about 100’ away. It was pretty cool! We have yet to hear them yip or howl. We have enjoyed a few campfires with friends and some beautiful sunsets. One evening we had a drumming session and everyone had the opportunity to play a percussion instrument if they wanted to. The sky was really dark and clear – the stars were vibrant and we looked for constellations. This picture is of an Indian landmark – if you look close you will see the head of the Indian chief lying on his back with his nose pointed towards the sky. The forehead is towards the right and his chin is to the left. Underneath the chin section of the Indian, there is a lighter section of rock, not quite white, that is in the shape of a running horse. That is the chief’s horse. 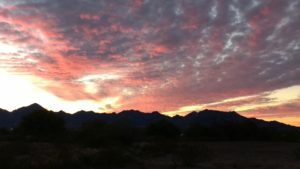 We will close with a few pictures of some sunsets – enjoy! 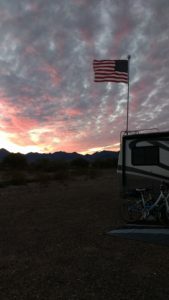 This entry was posted in Arizona and tagged Boondocking, Flagpole Buddy, Koni shocks, Quartzsite. Bookmark the permalink. Beautiful photos of sunsets and Indian landmark. 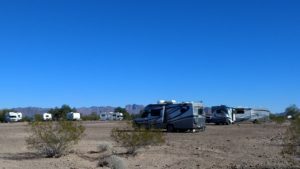 Looks like you are having so much fun that you may want to become full-time desert rats! We’re glad you’re keeping an eye on us! It has been a great adventure so far! And of course …. I Like the Flag Pole! Yes, we like it too. We’re looking forward to showing our colors at Presque Isle this summer!